Warwickshire's bowling coach Graeme Welch expects seamer Chris Wright to shine after agreeing to continue at Edgbaston this summer. Wright, 26, impressed on loan with the Bears from Essex last season, claiming 22 wickets in four Championship games. 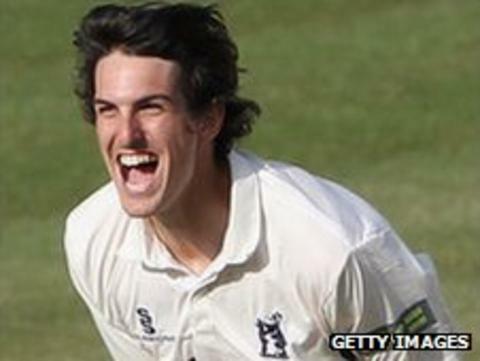 "I always thought Chris was a good bowler, I coached him for two years at Essex," Welch told BBC WM. "We've got to work on his one-day cricket but he'll be a great acquisition for the club." Warwickshire are building up a strong stock of young seamers, with Wright joining Chris Woakes, Keith Barker, Andy Miller and Boyd Rankin on the staff. "With Chris, the thing that impresses me is that when the ball swings he can swing it. If the wicket's up-and-down he's quick enough and slippery enough to hit you on the head," Welch observed. "Keith Barker's done a lot of work in the winter, Andy Miller's done a lot of work in the winter, then you throw Tom Milnes in there who's a 19-year old lad. "So hopefully in two or three years time we'll have nine or ten first class bowlers so you can start resting people for certain games - horses for courses for bowlers on certain wickets." The Bears made an unexpected run at the Championship title last summer, but were pipped on the final day of the season by Lancashire. And Welch sees no reason why they might not be contenders again in 2012. "The way we played our Championship cricket last year is proper cricket, attritional cricket, wearing teams down and we did that successfully. I can't see how that's changed. "Confidence breeds confidence - if you put yourself in that situation, the next time you know how to deal with it."